After a sad good bye to all our friends in Cordova, we finally sailed off. Leaving after a week of leaking water tanks, clogged drains and generally fixing one problem just to find the next, it was good to get moving. We had decided to give the North-West Passage a try. The first few days were very calm as the wind slowly pushed us west. What was lacking in wind, was made up for in wildlife. We saw our FIRST ORCA!!! 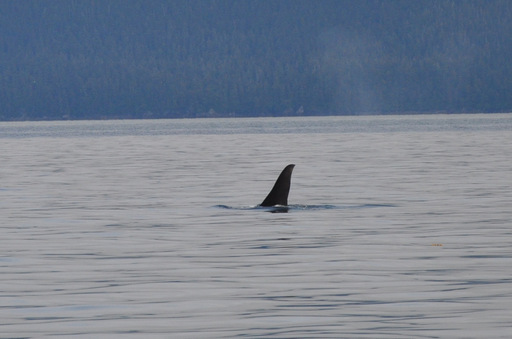 A large male slowly travelling past us toward Orca Bay. Salina and I did a little dance of excitement. We’d been talking about seeing orcas all last year in the Caribbean/Pacific. We didn’t think we’d see the first one together a year later. We also spotted sea otters, Dall’s and harbour porpoises, harbour seals and two deep feeding humpbacks on our way to Naked Island. 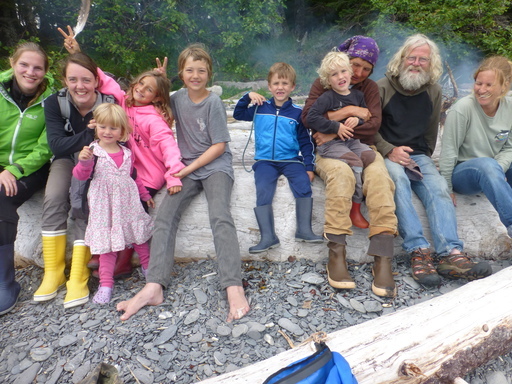 In Main Bay we picked up Soren who joined us to Derickson Bay for the next few days. Derickson Bay is a bay ending at the Nellie Juan glacier. The turquoise water looked extremely inviting so we made a swing for the kids off the Spinaker Boom. In the afternoon Anja and I hiked to the top of the mountain we could see from Pachamama and got eaten up by the mosquitoes on the way. The view was definitely worth it though. 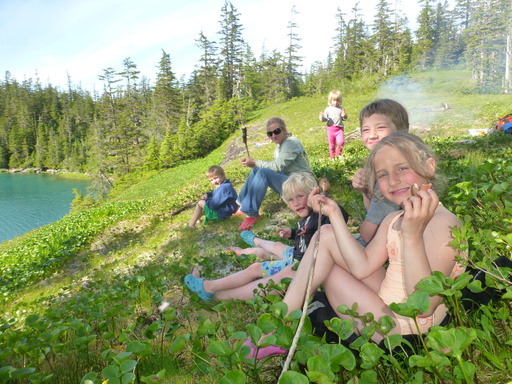 In the meantime the others went for a swim in the nearby lake and then made some ‘Schlangebrot’ over the fire. 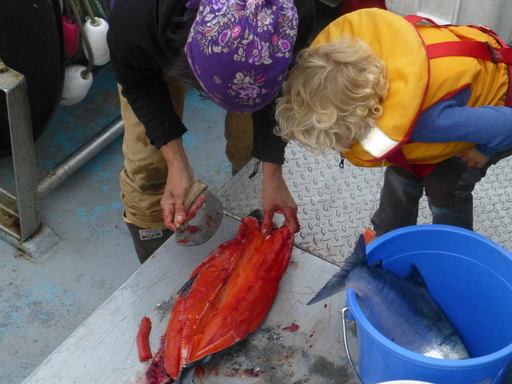 Back in Main Bay we got two Salmon from a tender and Kris taught Sabine another way to gut it. This meant enough fish for the next few days! We managed to grill some moose meat and half cook our salmon over the fire before we had to hurry off due to good winds for sailing to Kodiak. But bad weather hit us just before entering the Bainbridge Canal and we decided to hide in a little cove of Squire Island. There the Battery bank went flat and we had to rebuild it using the few cells that were working fine. However this then only had half the capacity of the previous one. The next morning our navigation computer crashed and soon after the screen of the back-up computer also broke. We decided to volunteer at the whale camp at the Southern tip of Knight Island and head back to Cordova in time for music camp. 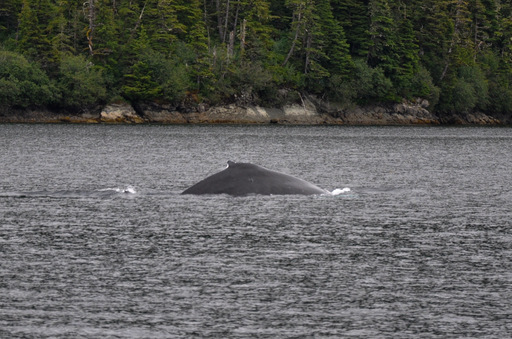 Within minutes of arriving we were all huddled into the warm cosy tent of Whale Camp 1 listening to Shelly’s stories about the humpback whales she is studying. She knows so much and we could have listened for hours. We learnt how they sleep with one half of their brains awake, how the SE Alaskan groups have taught the ones here to bubble net feed, how they reproduce, their migration routes and much more. Apparently there were only 1’200 individuals left before the whaling was banned here and have now recovered to around 26’000 with a yearly increase of about 6%. 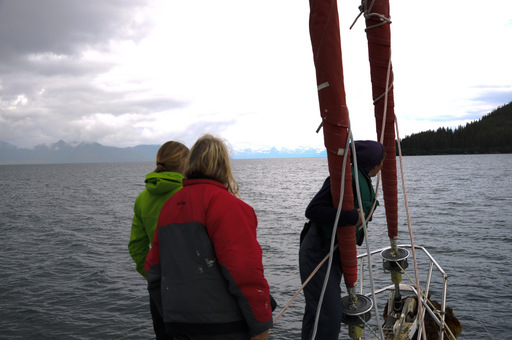 The whale researchers joined us on board Pachamama for two trips to find some humpback whales and identify them. Both trips were successful and we managed to identify two and follow one new to the area. 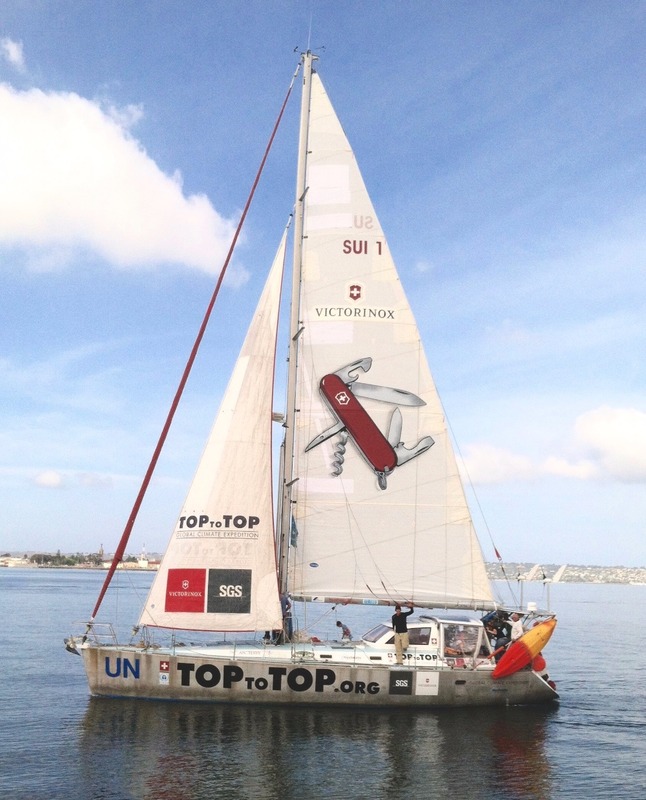 We will be collecting data for them as best we can on Pachamama as we sail on. We will be collecting data for them as best we can on Pachamama. 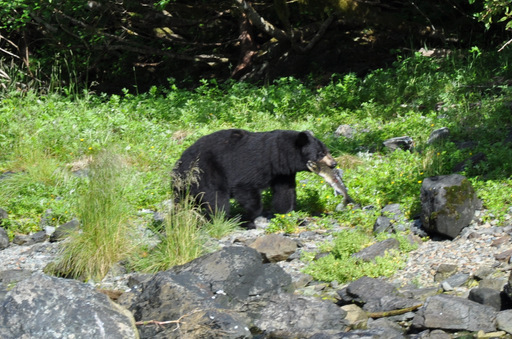 Yesterday we were lucky enough to watch black bears fishing for salmon. In the morning we had been talking about wanting to see bears fishing before leaving Alaska but who knew that this would be the day! We had seen salmon jumping out of the water and eagles fishing ahead so we decided to paddle closer. 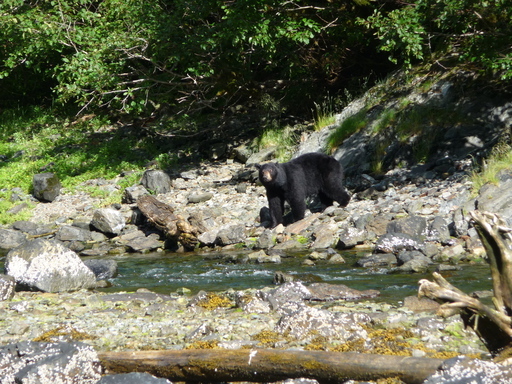 Soon after we got to shore the first black bear appeared at the far end of the stream. The way they lunge into the stream, splash around a bit and then come out with a salmon wriggling in their mouth was amazing to watch! Though one of them came a little close it was only interested in the large salmon swimming up the stream. The children were happy to be back in the dinghy as we paddled away. We were happy to find Snug Harbour so clean, as we expected a lot of plastic to be blown in. So no need for a clean up there. Because of an approaching storm we went to hide in the lee of Green Island, where James Cook found shelter many years ago. We hid there for 3 days due to 4m waves and gusts of up to 55 knots, which gave Sabine time to perfect the Denali film. 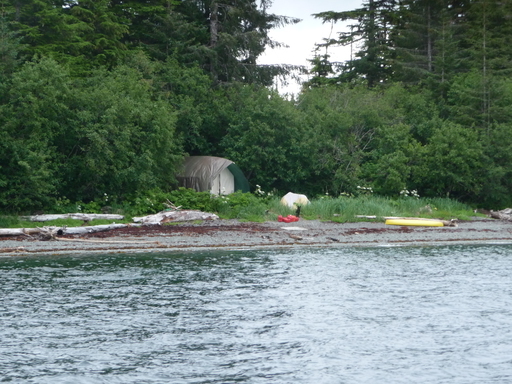 From Green Island we went to Olsen Bay on the eastern side of PWS, this bay was also garbage free and we saw a grizzly in the distance. As we sailed around the corner to Cordova the kids were jumping with excitement. The music camp is great- the kids are learning a lot and thoroughly enjoying it. 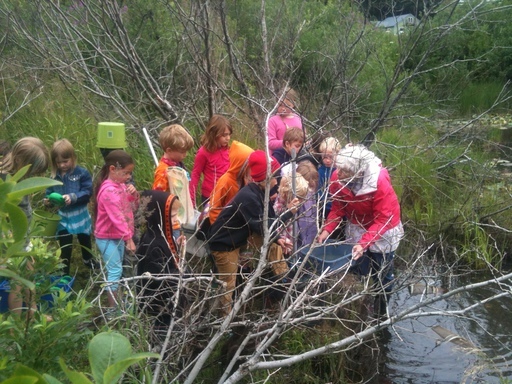 Today Belle took them on a great field trip looking at the local fauna and flora, thereby connecting the kids not only to music but also to nature. On Sunday we are heading South due to too much ice in the NW-Passage. We will try it next year.